Picture the scene, it’s an all to near future and little Lucy looks up from her 4DS internet gaming slate. “Tell me what games were like when you were a boy, Grandpa?” she asks curiously. “Oh they were wonderful!” her grandfather enthusiastically replies. “You could go to these big buildings called shops and buy these little spinning discs, that had the games on!” he continued. “You’ll never believe this but, once you’d bought your game that was it, you played it and used your skill and guile to finish it”. “Wow gee!” said Lucy, her eyes wide with wonder “You mean you never needed to buy more gems to pass a level?”. “Darn right kiddo!”, replied her grandfather. “In fact speaking of gems, I might just have the one game here that started the whole darn gem swapping craze!”. 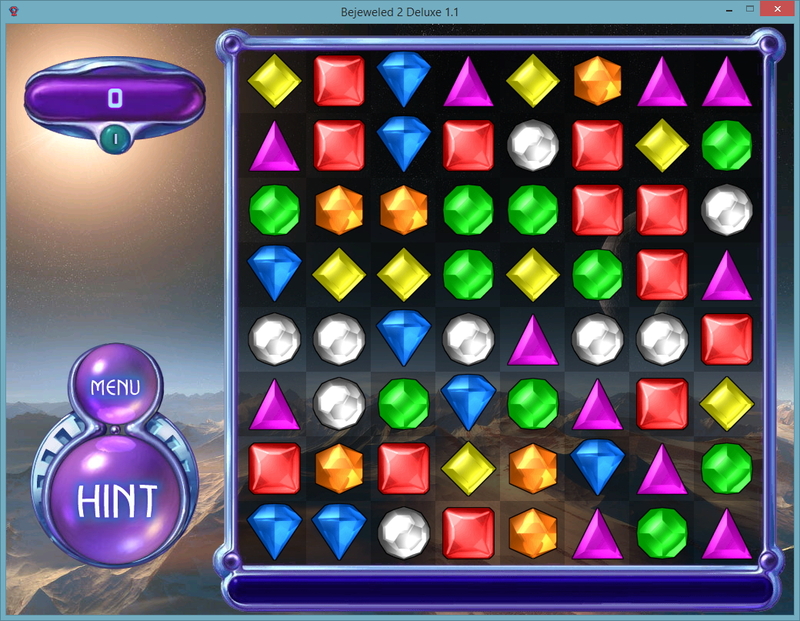 Bejeweled 2 should install on a modern PC with no problems. Simply insert the disc into your computers optical drive and follow all the on-screen prompts. If the installation menu does not automatically appear, browse to the CD in Computer/This PC and open the PopCDRun program on the disc. The Focus Multimedia CD-ROM version of the game is already patched to version 1.1 so there are no patches to install. You can now start the game from the Start menu or Start screen by searching for “Bejeweled 2” and clicking on the icon that then appears. 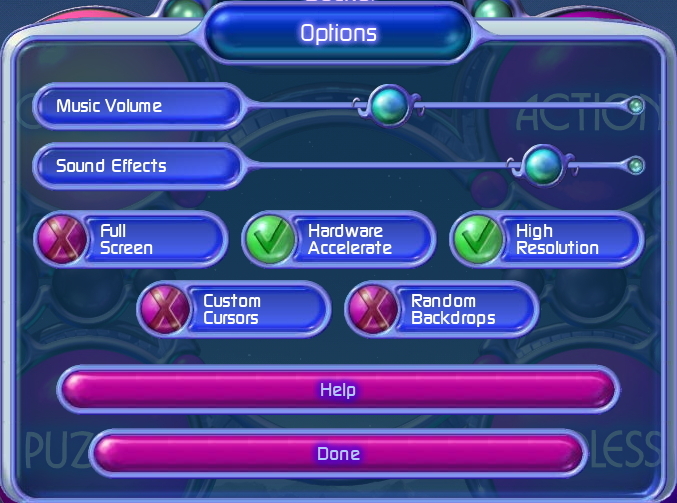 Before you get started with the game, you might want to visit the options menu. This isn’t a complex 3D game so there aren’t an awful lot of options to configure. The picture below shows the available options. For best results, ensure that “Hardware Accelerate” and “High Resolution” are both ticked/checked. The rest of the options can be configured to taste. Click on “Done” when you have set the options. That’s it, there are no more options to configure or tweak, now get swapping those gems! Is this the game that started the whole match three craze? One of the best puzzle games, along with Tetris. I always preferred Jewel Quest to this.